The Fusion of glass, sand, and colorful paintings punctuate The Delaware Contemporary's newest exhibition by the complimentary, yet distinct, work of artists Allen C. Smith and Connie Zehr. 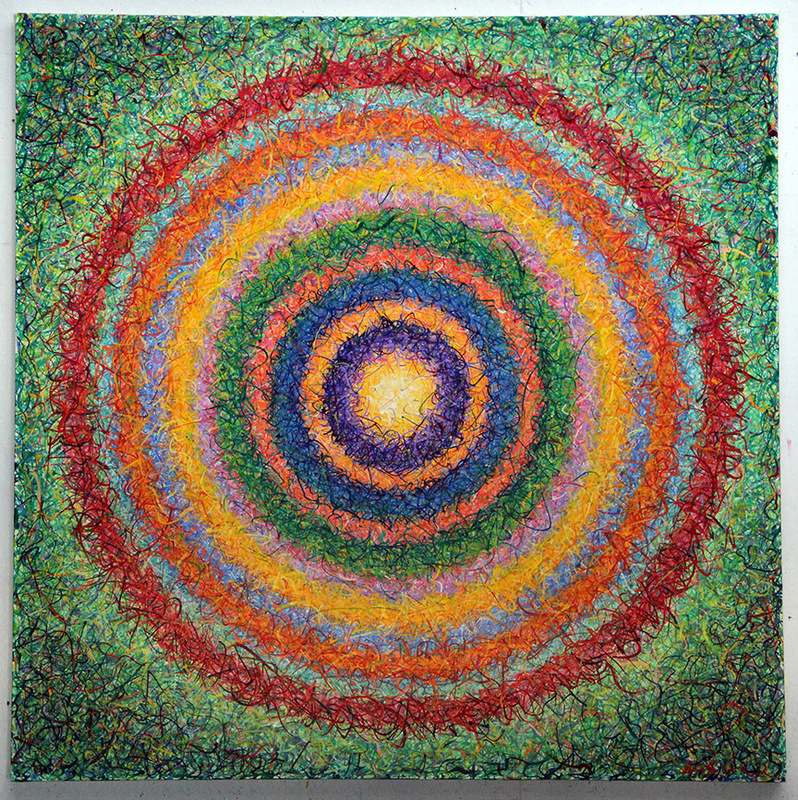 The organic materials of Zehr's sand and glass installations paired with Smith's energetic, brightly colored oil paintings serve as symbols of metaphysical experience and observation. Large-scale paintings by Allen C. Smith manifest his process of color selection through a frenzy of polychromatic lines echoing an emotional response to music. Though striving for minimalistic abstraction, his work evokes fascination with geometric design and random theory. In one series, the color order is determined by the toss of a coin. This random and improvisational activity releases the artist from the weight of choice, thereby offering himself the same experience as his viewers. While hints of abstract expressionist painters come to mind, the fluid quality of the line creates a uniquely visceral viewing experience. While Smith's work centers on the core of his synapses and evidential marks of his existence, Connie Zehr's work creates a surrealistic, vibrating energy symbolic of growth, even fertility. Zehr's ambitiously scaled installations of sand topped with glass finials explore the natural world of topography and movement through space. They are part panoramic landscape, part ephemeral earthwork, part painterly, and part meditative. Zehr's graceful, rhythmical vision uses "matter as fact and as metaphor." The patterns found in the sand, and then reflected in the glass, create a startling visual sensation as the viewer navigates around the installation: seeing both the object and the image of the object. The fusion of these two artists brings the viewer into their own metaphysical experience as a unifying and transformative participant. Allen Smith received his BFA from Pratt Institute, Brooklyn, NY. He is a recipient of the Crossroads Grant from the New York State Council of the Arts. His work has been featured in museums such as the Albright-Knox Gallery, Buffalo, NY and the Arnot Art Museum, Elmira, NY. His work has been featured in the prestigious Rochester-Finger Lakes Exhibition at the Memorial Art Gallery, Rochester, NY; group shows in Corning, NY, the Nina Freudenheim Gallery in Buffalo, NY, as well as numerous galleries and art centers. Connie Zehr received her BFA from Ohio State University, Columbus, OH. She is the recipient of a number of grants, including the Fletcher Jones Grant and the National Endowment for the Arts individual and Landmark Projects grant. She is featured in numerous publications and books for her work, notably included in Sunshine Muse, by Peter Plagens. Her work has been shown at The Whitney Museum of American Art, New York, NY; The Museum of Contemporary Art, Chicago, IL; Pasadena Art Museum, Pasadena, CA; Taipei Fine Art Museum, Taipei, Taiwan; Salvatori Ala Galeria, Milan, Italy; Wadsworth Atheneum, Hartford, CT; and Newspace Gallery, Los Angeles, CA.